The Great Recession, as harrowing as it was a decade ago, seems to have faded from public memory. It is safe to say that a general sense of normalcy pervades the lives of most Americans. Today, the economic environment could not be more optimistic: The U.S. stock market is hitting new highs, unemployment is at historically low levels and home prices have rebounded to their pre-crisis highs. Banking profits have roared back. Herring points to another challenge. “The closely related problem is that the European Union is trying to run a monetary and banking union without a European fiscal policy,” he says. “Because European banking regulations do not address differences in country risk among European member states, European banks are often heavily exposed to member countries that encounter debt problems. 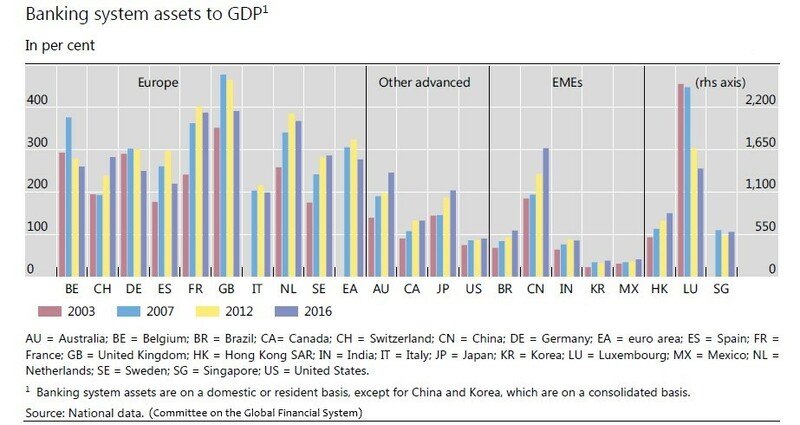 Thus, in addition to the financial crisis, Europe has had to contend with a series of country debt crises.” At the time, Portugal, Italy, Ireland, Greece and Spain could not repay or refinance their government debts or bail out their own distressed banks without help from the ECB, International Monetary Fund (IMF) and more stable EU nations. In general, banks have moved away from holding “complex or capital-intensive assets” towards assets that typically pose less risk, the report said. Moreover, “many large banks have reduced their exposure to trading assets and more complex securities.” Another trend among big banks is that they have decreased activities in over-the-counter derivatives due to new regulations. This is particularly apparent in global, systemically important banks, according to the CFGS. In the meantime, their common equity capital ratios have risen “significantly” since the crisis. The entire premise is simply dead wrong that the global financial system was the root cause of the Global Financial Crisis. It was the Federal Reserve that triggered the crisis, not the banks, nor Fannie Mae or Freddie Mac, nor was it Wall Street. And the truth of that proposition can be easily and quickly demonstrated. Next, there were housing bubbles not only in the U.S. but across Europe and Australia of equal magnitude. However, the U.S. bubble started 1-2 years ahead of Europe and Australia. The facts will show that it was Federal Reserve triggered a chain of events when it plunged its federal funds rate from 6.5 pct in 2000 all the way down to 1 percent from mid-2003 to mid-2004. First, there was a massive flow of funds into subprime mortgages in a “reaching for yield,” converting a red-hot housing market into a raging inferno. In addition, trillions of dollars flowed out of the U.S. into Europe as evidenced by a 60 pct increase in the Euro to Dollar exchange rate. Included were heavy borrowing by European banks from the U.S. money markets. Adding to the global tsunami wave of funds flows was the $4.9 trillion 1997-2007 U.S. trade deficit – the lion’s share of Ben Benanke’s “Global Savings Glut.” The massive flow of funds surged primarily into home mortgages, creating the housing bubbles but, in the aggregate stimulated a global economic boom which, in turn, led to a global commodities boom. Since most commodities are priced in dollars the surge in the Euro naturally made commodities that much cheaper in Europe. Oil, for example, surged from under $30 a barrel to nearly $150. Exploding commodities prices in turn forced the Federal Reserve to slam on the money brakes, jacking its federal funds rate from 1 pct to 5.25 pct in July of 2006. An estimated 75 pct of all mortgages during the low-interest rate years were adjustable rate mortgages. The resetting of such mortgages combined with the effect of higher interest rates on the entire housing market effectively sliced the housing market – and the economy with it – off at the kneecaps. The money market spigots were shut tight such that European banks could not refinance their short term borrowings. The European banks were in far worse shape than U.S. banks. banks made with housing activists totaling $4.57 trillion of minority lending commitments, primarily for subprime mortgages. $4.51 trillion of that amount was “negotiated” after 1994. Every dollar of the $4.51 trillion of post-1994 “CRA Commitments” were “negotiated” on the watch, under the noses and with the implicit approval of the banking regulators, overwhelmingly by the Federal Reserve. So, why were bang “negotiating with activists in the first place. The story goes back to the administration of George Washington. Thomas Jefferson advocated for a banking system geared to the yeoman farmer, hence our banking system was composed primarily of horse-and-buggy community banks. A national banking system emerged after the Civil War. However, national banks could not operate across state lines. “CRA” is the acronym for the Community Reinvestment Act of 1977 as amended in 1989. Initially it was intended to “encourage” banks to look for lending opportunities in “underserved” markets. However, in 1995 (or 1994) President Clinton revised the CRA regulations to “emphasize performance.” In other words, banks were required to write subprime mortgages. In 1994 the prohibition against interstate banking was repealed, triggering a tsunami wave of merger applications. However, bank applying for a merger approval was required to demonstrate it was writing a sufficient quantity of “affordable” mortgages (i.e., subprime mortgages). Regulators allowed activists to intervene to protest that a bank was not writing a sufficient quantity of subprime mortgages. In 1991 activists staged a two-day sit-in of the House Banking Committee and were rewarded with the passage of the Government Sponsored Enterprises Act which mandated that Fannie Mae and Freddie Mac allocate 30 pct of their mortgage purchases or mortgage guarantees to “affordable housing.” The purpose was to create a market for subprime mortgages. President Clinton upped the mandate to 50 pct in 2000. President Clinton also went after mortgage bankers, threatening them with lawsuits and and the possibility of folding them under the CRA. Mortgages outstanding nearly tripled between 1997 and 2007, increasing by $7.1 trillion. The banks’ share dropped from 32 pct in 1997 to 28 pct in 2007; the share contributed by the government sponsored enterprises fell from 50 pct to 39 pct while the pct accounted for by private mortgage entities soared from 7 pct to 20 pct., driven largely by mortgage bankers. Most importantly, reading from a graph prepared by the Federal Reserve Bank of San Francisco, the share of total mortgages represented by subprime mortgages jumped from about 4 pct to over 33 pct. Clearly, it was government, not the private sector, that drove the housing market to the point of collapse in 2008!